HP has discontinued their 2000 series budget laptops. If you are looking for a low cost laptop options, be sure to check out the Best Laptops Under $500 for some more current options. Oct 22 2012 - HP's 2000 laptop isn't necessarily a bad laptop but it doesn't really have much to set it apart from other laptops in the $400 price range. In terms of features, the only real distinguishing feature it has over the competition is a high resolution webcam. Beyond this, it is pretty much what one can find in almost any laptop at this price point. The problem is that it lacks either a bit more performance, memory or USB 3.0 ports that some of its competition does provide. 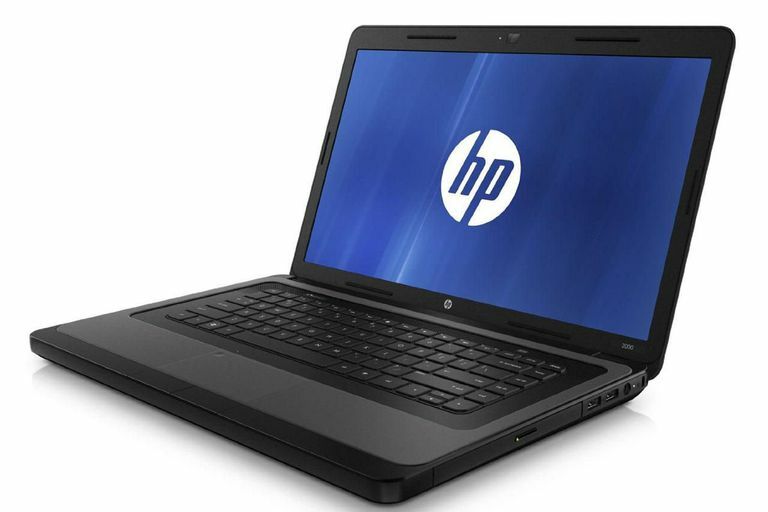 14.8" x 9.7" x 1.4"
Oct 22 2012 - The HP 2000 is a new low cost laptop from the big computer company that forgoes the use of its use of the Pavilion name that it uses with the majority of its consumer systems. In fact, this laptop actually shares much in common externally with the Compaq Presario CQ58 laptop but it is based around the Intel platform rather than AMD. For around $400, the system uses the Intel Pentium B950 dual core processor combined with 4GB of DDR3 memory. This provides it with a decent level of performance that will be sufficient for the majority of computer users but still doesn't have quite the same level of responsiveness as those built around the faster Core i3 processors. Storage features on the HP 2000 are pretty typical of a $400. It features a 500GB hard drive that provides a good deal of storage space for applications, data and media files. The drive spins at the traditional 5400rpm spin rate that provides it with modest performance. The only real drawback here is that the system does not feature any USB 3.0 ports for use with high speed external storage. This is still fairly uncommon at this price point but it is something that the ASUS X54C does come with. A dual layer DVD burner handles playback and recording of CD or DVD media. The display panel for the HP 2000 uses a standard 15.6-inch display panel that uses TN technology and features a 1366x768 native resolution. Brightness is good but the viewing angles are still quite narrow primarily because of the TN panel. This isn't uncommon for low cost laptops. The graphics for the system are a bit below par due to the Intel HD Graphics 2000 built into the Pentium processor. This version lacks any real 3D performance, even less so than the HD Graphics 3000 found in the Core i3 based laptops costing just a bit more. What it does offer instead is the ability to accelerate media encoding when using Quick Sync compatible applications. Be warned that even this is going to be less of a boost than laptops with a HD Graphics 3000. Rather than using the isolated keyboard designs of the Pavilion series, the HP 2000 uses a more traditional design with fairly flat keys. It is a functional keyboard but doesn't have the same level of comfort as HP's more expensive laptops. The trackpad is fairly wide but rather short for a 15-inch laptop which can make it more difficult to use. This was likely done to try and prevent accidental pressing when typing. The palmrest area uses a very shiny plastic coating similar to the exterior lid. While it is very attractive when new, it quickly shows smudges and dirt that will require frequent cleaning to keep its appearance. While the HP 2000 is designed as a low-cost system, HP did not skimp on the battery by using a six-cell battery pack with a 47WHr capacity similar to that found in its Pavilion laptops. In digital video playback tests, the laptop was able to run for three and a half hours before going into standby mode. This is pretty typical of a 15-inch laptop. It is still much shorter than the HP Envy Sleekbook 6 that has a larger battery and more power efficient profile. It also falls short of the Dell Inspiron 660s that uses the Ivy Bridge processor. At its $400 price point, the HP 2000 faces a number of competitors even from its own Compaq division. The ASUS X54C mentioned previously offers a Core i3 processor, more ram and the previously mentioned USB 3.0 port but has a smaller hard drive and battery. The Compaq Presario CQ58 uses a slower AMD processor with less memory, less hard drive space yet the same overall chassis as the HP 2000. Dell's Inspiron 15 uses an older chassis design with a Core i3 processor and Bluetooth. Toshiba's Satellite C855 features a USB 3.0 port but has less storage space but it slightly more affordable.